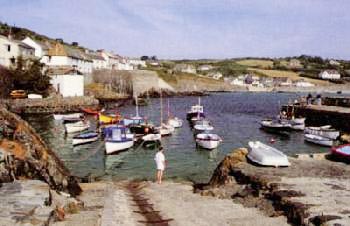 Coverack on the southern edge of the Lizard Peninsula, is a small picturesque fishing village built on two sides of a spur of rock that juts out into the sea. The village retains much of its original charm and atmosphere. The beach at Coverack is a large, sheltered, crescent shaped arc of sand, that can be quite rocky in places, but is ideal for swimming & windsurfing. There is easy access to the beach from the small car park at the edge of the village. Refreshments in the village adjacent to the harbour. 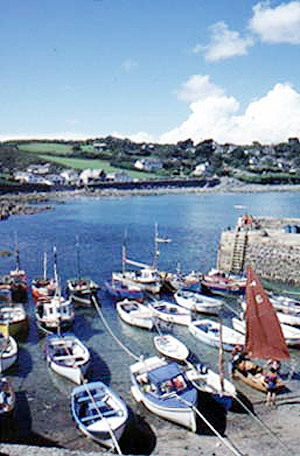 Sat Nav Co-ordinates: N50º 01' 33.84" W5º 05' 51.81"
Fishing boats and pleasure craft shelter in Coverack's small harbour - built out of the local green serpentine rock ( some of the oldest geological strata known to exist). Coveracks quiet harbour, seems a peaceful and sheltered place on a sunny summer's afternoon - but the photographs in the bar of the Paris Hotel show just how devastating a storm here can be. The Paris hotel is named after an American passenger liner which ran aground off Lowland Point in 1899. There was no loss of life on that occasion, but only a year before that the steamship Mohegan was wrecked on the dreaded Manacle Rocks beyond Lowland Point and 106 people were drowned. Soon after that a lifeboat was stationed at Coverack (the stout lifeboat house built just by the harbour) because, as was said at the time, 'the fishermen of this village are familiar with the Manacles and the boat could be launched in all waters'. 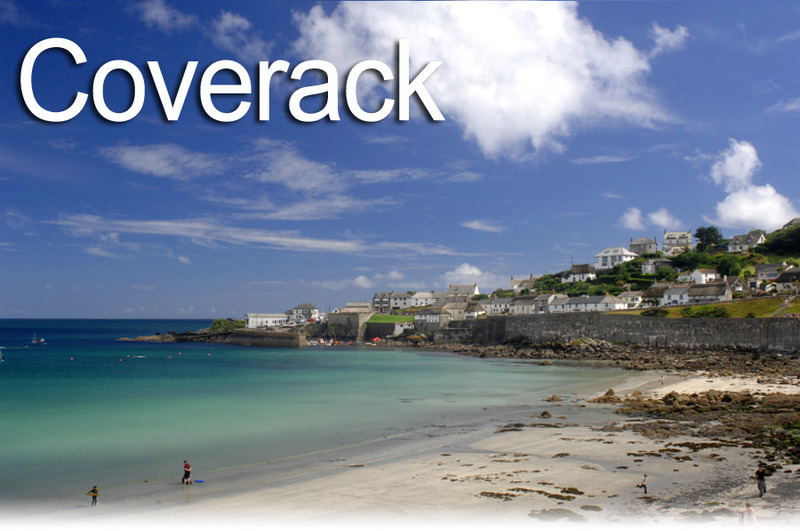 Coverack is the ideal holiday location for watersports such as snorkelling, scuba diving and windsurfing. There is a pleasant walk from the main car park ( limited spaces) along the coastal road up to the harbour, where you will find cafes, shops and toilets. This is an ideal spot to relax and enjoy a short break in the cafe that overlooks Coveracks picturesque harbur.